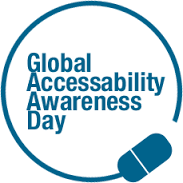 MAMEM joins the Global Accessibility Awareness Day. Check our video! May 18 2017 is the sixth Global Accessibility Awareness Day (GAAD) that aims to get everyone talking, thinking and learning about digital (web, software, mobile, etc.) access/inclusion and people with different disabilities. The target audience of GAAD is the design, development, usability, and related communities who build, shape, fund and influence technology and its use. While people may be interested in the topic of making technology accessible and usable by persons with disabilities, the reality is that they often do not know how or where to start. Awareness comes first. Read the blog post by Joe Devon that inspired GAAD. communication and exchange in leisure (e.g. social networks) and non-leisure context (e.g. workplace). Check our video for a comprehensive overview of MAMEM project!